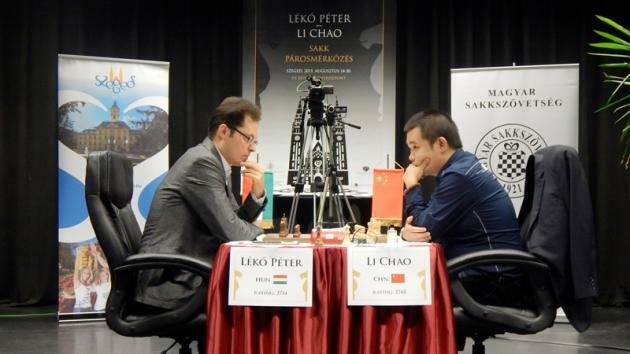 GM Li Chao of China defeated GM Peter Leko of Hungary 4-2 in a friendly match held in Szeged, Hungary. The Chinese player won two games and drew the other four. The match was organized by the city of Szeged and the Hungarian Chess Federation. It took place August 14-20 at the IH Event Center in Szeged, Leko's hometown since he was one. Leko hasn't been very active lately, and the idea behind the match was to get him warmed up for the upcoming World Cup in Baku. The Szeged match was played at the traditional FIDE rate of play, like in the World Cup: 90 minutes for the first 40 moves followed by 30 minutes for the rest of the game with an addition of 30 seconds per move starting from move one. The first three games were played August 14-16, and then there was a rest day. On the 17th, the players both played a 20-board simul. The second half of the match took place August 18-20 . The first game was a hyper-correct draw, where Leko easily equalized in a Symmetrical English. As early as move 20 the following position was reached, and it was time to shake hands. The second draw was more interesting: a Sicilian with castling on different flanks. Leko might have missed a chance in the early middlegame, and then he had to defend for a while. Li Chao was the first to strike in game three. His novelty on move seven caught the eye, but Leko couldn't blame his opening play. Some indecisiveness with his queen eventually lost him a pawn, and for the Chinese player that was a matter of technique. Hungary's number one vs. China's number two. | Photo courtesy of the official website. After the rest day it was again Li Chao who won, further improving his score to 3-1. Losing this game was a small disaster for Leko, who was a healthy pawn up. This time he played the Petroff, an opening that is much less popular than 10 years ago, but just about as solid! Nonetheless, White won a pawn, but allowed his opponent to become very active and then got stuck in a terrible pin. Li Chao won two games in a row. | Photo courtesy of the official website. Game five was the third Symmetrical English, and yet again it was Li Chao who deviated first, and came with the theoretical novelty. This time it was Leko who won a pawn. It wasn't a great result for Leko, but not a surprising one either. He only played one tournament this year (the World Teams in Armenia), so his many missed opportunities are likely the result of rustiness. do well in Baku. | Photo courtesy of the official website. The Order of Saint Stephen is a royal order in Hungary, founded in 1764 by the empress Maria Theresa of Austria. It consisted of the grand master (the sovereign), 20 knights grand cross, 30 knights commanders and 50 knights. The badge is a green enamelled cross with gold borders, suspended from the Hungarian crown; the red enamelled medallion in the centre of the cross bears a white patriarchal cross issuing from a coroneted green mound; on either side of the cross are the letters M.T. in gold, and the whole is surrounded by a white fillet with the legend Publicum Meritorum Praemium. The ribbon is green with a crimson central stripe. The collar, only worn by the knights grand cross, is of gold, and consists of Hungarian crowns linked together alternately by the monograms of St Stephen, S.S., and the foundress, M.T. ; the centre of the collar is formed by a flying lark encircled by the motto Stringit amore. (Source: Wikipedia).